Listen to the accompanying podcast to this article. Blasting drums and trumpets accompanied by enormous searchlights. A regally dressed torch-lady offering glorious, blinding fire. A snow-capped mountaintop surrounded by revolving stars. A fairy-tale castle emblazoned with light. A lion roaring. These are some of the grandiose sights and sounds that have served as introductions to American films, the studio logos and musical themes that inform viewers that they’re not only about to enter the world of a movie, but that the movie is, no matter its address, an event. There is perhaps no clearer evocation of the lasting notion of film as spectacle than these brief preambles, which place every marked film on the same level playing ground. (The Warner Bros. logo, in all its permutations over the decades, has remained a consistently subtle rejoinder to the hyperbolic pronouncements from such outfits as Fox, Columbia, Paramount, Disney, and MGM.) The movie as monolith, even as holy entity: the opening moments, functioning like the glossy wrap on a present about to be opened, are sparkling enough to make one forget that we’re simply watching product branding. The bombast of these pronouncements couldn’t be further from the world of a non-studio, intensely personal artist like Terence Davies, but the British filmmaker nevertheless begins the narrative proper of his 1992 masterpiece The Long Day Closes with the blazing brass pomp of Twentieth Century Fox’s iconic fanfare, written by Alfred Newman. Indeed it’s the first thing you hear post a particularly lengthy (almost five minutes) opening credit sequence set to a familiar minuet by Luigi Boccherini that has come to stand for arch European elegance. In its own way, the classical piece is as instantly recognizable as the ostensibly more crass one that follows: these are two undeniable mood-setters, and they're uncomfortably buttressed against one another. When the Fox theme begins to blare, we’re disturbed out of reverie. The disconnect is immediate and astonishing: perhaps for the first time, we hear the music blasting without seeing its attendant image of that titanic, golden company name perched cliff-side, mammoth beams of light bursting forth into the sky from all sides (it was originally designed by a landscape artist, Emil Koza, Jr.). The image is hulking, the music is bombastic; but we’re used to its arrogance, and we probably have been since childhood—it’s graced the very beginnings of movies from Star Wars to Aliens, and it’s even been slightly altered when deemed necessary (as when snow softly blanketed it for Edward Scissorhands or when it appeared submerged under water for Minority Report). Now, divorced from its mountainous context, we wonder what the music is trumpeting, and what Davies is announcing himself. For when the music blasts, it is over a close-up image of a gray, brick wall. For the entirety of the theme’s 20 seconds, the camera remains immobile. We’re pressed so close to the drab cement that it seems as though we can graze its rough textures with the tips of our noses. Then when the last percussive vibration dies away, the camera descends; we realize we’re on Kensington Street, in soaked Liverpool, 1956. Natural sounds enter, briefly unenhanced by music, and we hear pouring rain. It’s a drenched alleyway, drained of people. Heavenly strings finally emerge on the soundtrack to drown out the rain. It’s the instrumental introduction to Nat King Cole’s version of Hoagy Carmichael’s haunting “Stardust,” and, in effect, The Long Day Closes’ third musical overture, following the Boccherini and the Newman compositions. Thus the fanfare is, quite unusually, sandwiched between two other pieces of music, each far more dulcet. The fanfare isn’t there to introduce the film, nor is it there to set the tone; it’s an element of collage. This is a severe artistic reappropriation, even a shocking one, and it instantly establishes Davies’s film as extraordinary, a tapestry of sounds and images rather than a conventional story and a stream-of-consciousness compendium of interrelated memories instead of a cause-and-effect narrative. So, just why does Alfred Newman’s brassy music suddenly flare up at the opening of an eighty-minute dreamlike reminiscence on a Liverpudlian childhood? The clearest, most literal rationale comes almost immediately, with the film’s first line of dialogue: after the camera has ever so slowly crept its way down the sidewalk and into a quiet house’s melancholy-looking front door, we hear a young boy brightly appeal, “Can I go to the pictures, mum?” Protagonist Bud, at that age when short pants start to look awkward, is a prepubescent surrogate for director Davies, and surely a movie addict. It’s clear as the film continues that going to the local cinema provides escape from the daily onslaught of school bullies, heart-curdled teachers, and a private loneliness complicated by a confused burgeoning homosexuality (expressed early and succinctly in a quick exchange of glances between Bud and a handsome, shirtless bricklayer, whose response to Bud’s fixed gaze is to mockingly wink back). Young Bud’s flight to the movies as a shadowy getaway from life’s unfairnesses is perhaps not all that unusual for people of a certain age (and certainly for those whose childhoods have been commemorated on film), but Davies’s approach to dramatizing it makes his predicament as beautiful and odd as a journey through the rarest jungle. Scenes are connected by only the thinnest narrative threads, or simply by sound bridges or graphic matches—the most common way of getting from here to there in The Long Day Closes, as in Davies’s previous film, the similarly autobiographical Distant Voices/Still Lives, is through song. 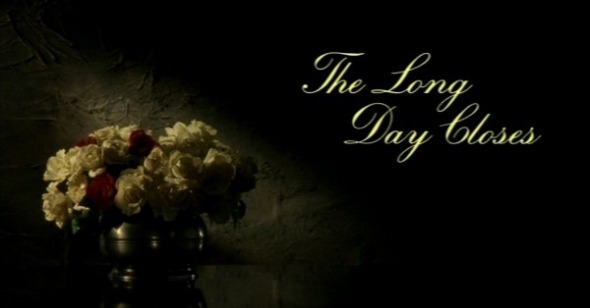 In fact there are probably more song lyrics than actual pieces of dialogue in Long Day Closes, standards and movie love themes and folk tunes that make Bud’s family life (with his single mother, two older brothers and sister) an endless continuum of music. Rather than speak of her daily toils and stresses, mother simply sings a sweet and low a capella version of “I Don’t Know Why I Love You Like I Do” while doing housework; instead of a voice over expressing his yearnings and unhappiness, Davies accompanies a scene of Bud sitting lonely at school with an operatic rendition of the 19th century folk song “Blow the Wind Southerly," his stifled imagination represented in a cutaway to an image of a gigantic sailing schooner. At times when music isn’t employed to speak to the characters’ feelings, passages of dialogue from other films are used as pseudo voiceover—Orson Welles intoning that George Minafer had finally got his “comeuppance” from The Magnificent Ambersons; John Truitt falling for Judy Garland’s Miss Esther on the banister from Meet Me in St. Louis. These aural snippets occur over some of Bud’s particularly somber moments, signaling that movie love and melancholy are completely intertwined in the darkest crevices of his memory. In this way, even as it heralds a triumphal beginning, the Twentieth Century Fox fanfare is just another piece in the mosaic. Davies’s use of Newman’s orchestral theme isn’t merely an instance of easy irony (an iconic burst of joy introducing a decidedly introverted tale), but a complicated simultaneous embracing and rejecting of institutions. The fact that so much joy was brought to Davies/Bud from products of basically restrictive studios (emblematic of the mainstream the filmmaker never wanted himself) links cinema to the other establishments with which the filmmaker expresses a dubious relationship—church, school. There’s even a bravura sequence near the end of The Long Day Closes that makes explicit the connections between these spaces, as vertical overhead tracking shots of a church pew, a classroom, and a move theater dissolve into one another with spectacular fluidity, set to the Debbie Reynolds hit “Tammy.” It’s the nightmare of nostalgia—the fond reminiscence of a long ago and far away that easily induces dread—that most unites Davies’s films, even his most recent films, The House of Mirth and Of Time and the City, love-hate letters to the past. Davies is no stranger to flourish, though the sort that begins The Long Day Closes and invokes such triumphant Hollywood brassiness is not what one would expect from a film whose final spoken words are voiceover echoes of Bud’s drab science teacher detailing the different kinds of erosion. Angrily squeaking out his lessons in chalk, the mustachioed instructor informs the students, definitively, that there are five kinds of erosion: river, rain, glacial, wind, and marine. Naturally, the disintegration of memory and consciousness doesn’t enter into the equation, even though this is the most tangible form of erosion to most of us. The Long Day Closes ends with an indescribably beautiful fixed shot of the sun quietly going down, hidden by ever thickening drifts of nighttime clouds and accompanied by the 1868 Arthur Sullivan lullaby that gives the film its title. One couldn’t dream up a piece of music more emotionally dissimilar to the fanfare the opens the film, yet taken together the two provide fitting bookends. The tyranny of memory affects us from both sides, haunting our daydreams and our nightmares, whether a hushed chorus or a scream of trumpets, blasting down through the terrible, lonely decades.